Novorussia: Independent, Associated or (Con)federated? September 02, 2014 “ICH” – First, I will begin by a clear disclaimer which I ask you all to please carefully read and then keep in mind: I personally am not advocating any option for the final status of Novorussia. That is for the people of Novorussia to decide and any option that they will chose I will support. Furthermore, at this point in time I am not even personally sure what option I would recommend if asked to do so simply because the devil is in the details, not the big words. What I propose to do below is to look at a number of issues related to this question but that analysis should not be interpreted as a personal endorsement of any solution. Second, I have carefully parsed the news out of Minsk, Novorussia and Russia and I am left with the strong feeling that nothing has really been decided, hence the apparent zig-zags and changing interpretations over the terms offered by the Novorussian delegation. Third, I urge everybody to be extremely cautious with Russian news sources including Russian TV channels and RT. Why? Because Russia has a major stake in this fight and that I am absolutely certain that the Russian elites are split on what the best solution would be for Russia. There are also informal, shall we say, “groups of like-minded people” inside the Russian media who are trying to promote the interest of their patrons and supporters. And while it is would be an oversimplification to say that, for example, NTV stands for “position A” while RT stands for “position B”, I know for a fact that inside RT, NTV, Rossia, REN-TV and the rest of various groups have various agendas: one editorial board might have a very different position than another one, even inside the same media outlet. Fourth, Russian interests should not be automatically conflated with the interests of Novorussia, just as the interests of the Russian and Novorussian elites should not be conflated with the interests of the Russian and Novorussian people. Seems obvious, but I feel that this should be clearly stated again because any agreement on the final status of Novorussia will be the resulting vector of the goals many very different interests groups and almost certainly end up being a compromise from which nobody will walk away with everything they want. Having said that, now let’s look at how this all began. Six months ago all the eastern Ukrainians wanted were a) guarantees for the Russian language and b) fiscal autonomy. That’s it. Nothing else. As for Russia, her position was equally clear: a united and neutral Ukraine respectful of the civil rights of all its citizens. Sounds like a no-brainer, right? As for the Ukrainian opposition, it officially wanted to remove an oligarch-controlled government and sign an Association with the EU. Again, pretty straightforward. Now, think of it, a compromise solution was rather obvious: the election of a new, non-oligarch controlled government which would sign an Association agreement with the EU and commit itself to the civil rights of all Ukrainians, including the cultural and linguistic rights of the eastern Ukrainians. Yanukovich even went as far as to offer Iatseniuk the post of Prime Minister. So why did it not happen? Because the protest movement was completely co-opted, hijacked, manipulated, controlled, financed, organized and run by the USA who used EU political elites and a group of bona fide Nazis to achieve regime change and draw the Ukraine into the AngloZionist sphere of influence. What they wanted was a Ukraine economically exploited by the EU and militarily owned by the US via NATO. This plan centered on not only severing away the Ukraine from Russia and its economic union with Belarus, Kazakhstan, Armenia and others, but to also on severing the economic ties between Russia and Europe (an old US goal dating from the Cold War when the US did everything it could to prevent the USSR from selling gas to western Europe). You can think of the Nazi freaks as the Ukie equivalent of al-Qaeda or ISIS: rabid hateful murderous lunatics who literally cannot contain their hatred and desire to oppress and murder. Of course, under US pressure, they tried very hard to act like sane and civilized people, but time and again they failed, hence the references to Russian speakers as sub-humans/non-humans, Timoshenko’s desire to use nukes to exterminate the “accursed Moskals”, the apparently crazy insistence that only Ukrainian be an official language or the equally imbecile categorical refusal of any form of federation. Needless to say, as soon as these crazies got to power, they immediately passed a series of fantastically stupid and provocative laws such as the re-authorization of Nazi propaganda or the repeal of the official status of the Russian language. Unsurprisingly, the folks in the east freaked out and correctly concluded that “the Nazis are back”. As a result, a double dynamic was created: the crazies in the USA (the Neocons) directly threatened the vital/existential interests of Russia while the crazies in Kiev (the Nazis) directly threatened the vital/existential interests of the population of eastern and southern Ukraine. In doing so they left the Donbass and Russia no other option than to react and directly respond to that danger. This is important because what has been done cannot be simply wished away and undone. Both Russia and Novorussia are now in a “survival mode” in which nothing short of a full elimination of these vital/existential threats will do. In other words, the US Empire’s AngloZionist project AND the Ukie Nazi experiment must absolutely and definitely be defeated and conditions must be created which will forever prevent it’s reemergence. First, I would argue that the Junta repression force (JRF) has been defeated. Not strategically (if only because it enjoys an immense strategic depth and still huge human and material resources), but operationally. All the signs are that the Novorussian Armed Forces (NAF) are careful not to over-play their hand or push too far to the west, so things look very good for Novorussia right now. Second, the Junta has also been defeated politically: if in the past the Ukrainian people had an oligarch-controlled government, now they have a government of oligarchs. And they know it. Furthermore, the Nazis have shown their true face (Odessa, Mariupol, MH17, MLRS and ballistic missiles used on civilians with white phosphor and cluster munitions, etc.). Third, predictably, the Ukie economy is in free fall and for all practical purposes the Ukie industry is dead. I would call that a full-spectrum failure for the Junta. Uncle Sam is not doing much better: Crimea is lost forever, the Donbass is also lost for all practical purpose, Putin is more popular than ever, the EU tensions with the US are up (the Czech and Slovak republics have both announced that they will veto any further sanctions against Russia), and the US puppet-junta in Kiev has completely lost control of the situation. As for the EU, it truly screwed-up badly. The recent election of Donald Tusk and Federica Mogherini to the positions of President of the EU Council and EU Foreign Policy Chief is definitely good news, but it is also too little too late. The mess left behind by Catherine Ashton and Herman Van Rompuy will take years of painful efforts to clear. Besides, that other crazy, Anders Fogh Rasmussen, is still there, every bit as crazy and pathetic as always. 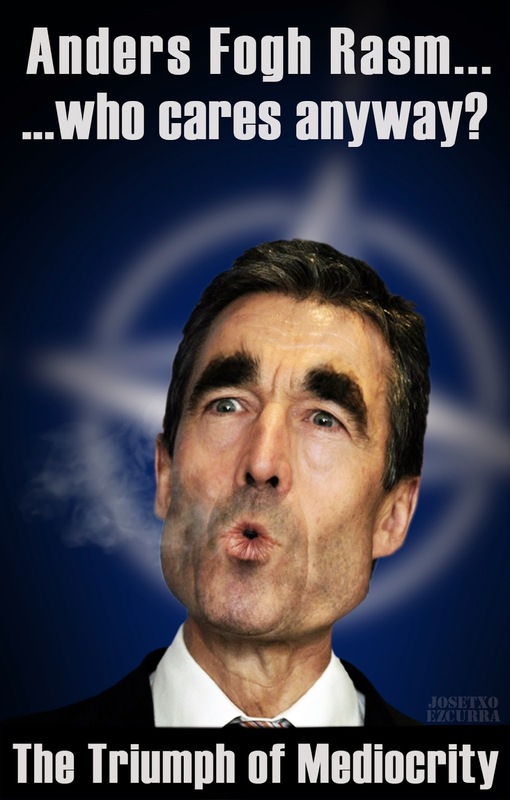 But for all the hot air blowing out of Rasmussen and a few more EU politicians, the EU has no stomach for more sanctions, much less so an ugly sanctions war with Russia. The Russians know that, and so all they have to do now is wait for the fruit to become ripe (or rotten, really) and fall down on their lap. There will be a NATO summit next week in Wales were Obama and his Neocon coterie of foreign policy advisors will most definitely push for a series of anti-Russian measure backed by very loud and macho statement about how Russia must be stopped, Europe protected and the NATO recognized as absolutely indispensable. More men, more guns, more threats and, last but not least, more dollars for the US military-industrial complex. Russia, however, will remain unimpressed for a very simple reason: the US and the EU have already been at the maximal anti-Russian policies for many years already. In fact, the only anti-Russian policies which the AngloZionist Empire has not adopted yet are those which would hurt it more than they would hurt Russia. Put differently, from now on any anti-Russian sanctions adopted will, by definition, hurt the AngloZionists more than they will hurt Russia (which they still will, of course). The conclusion is obvious: the West simply cannot afford a sustained sanctions war against Russia. The problem with the AngloZionists is that they are arrogant and stupid enough to stumble into a variant of the Israeli “Samson Option“: to strike out at their enemy even if that means bringing down the entire building on themselves. Contrary to many analysts, I don’t think that the Americans are actually dumb enough to deliberately start a war against Russia, much less so a nuclear one, but they are arrogant enough to paint themselves into a corner in which the only way to save face is to use military force. They are also capable of creating an extremely dangerous military situation in which even a firecracker can set off a shooting war (remember the insane USN posturing in the Strait of Hormuz or in the Taiwan Strait?). The Russians must absolutely remain aware of this danger and thus never assume that the Americans are rational or prudent. History proves that they are reckless and happy to create a situation resulting in war (US policies towards Japan before WWII are a perfect example). As I have mentioned already, the devil is in the details, but there are basically to main options for Novorussia 1) full (de facto and de jure) independence 2) practical (de facto but not de jure) independence. I honestly believe that any other option which would fall short of de facto independence is simply impossible to achieve. The Novorussians will not live under Kiev’s police or military, they will not pay Kiev more than purely symbolic taxes and they will most definitely not accept any limitation of their cultural, linguistic and economic rights, including the right to do business directly with Russia. I consider that option as so unlikely, short of a massive and sustain bloodbath, that I won’t even consider it any further. So let’s look at the two remaining options. Advantages: Security: possibility to either join Russia or sign a mutual assistance treaty which could include the basing of Russian forces in Novorussia. This would provide the ideal and maximal protection from any future attacks from the Ukies. Economy: no taxes paid to Kiev, association with Russia, full access to the huge Eurasian market, work for the Russian industry, social rights paid for by Russia (as part of an aid package). The joy of having fully won and to not have to deal with the crazies in the western Ukraine. Full and total de-Nazification. Disadvantages: maximalist position which leave no face saving way out for the crazies in Kiev and Washington, major difficulties in being internationally recognized. This option also leaves all the rest of the ex-Ukraine in the hands of the AngloZionists and Nazis who will constantly sabotage, subvert and disrupt the life of Novorussia. There is a real chance that this might mean leaving cities and regions like Odessa, Dniepropetrovsk, Kharkov, Chernigov, Nikolaev and many other historically Russian part of the ex-Ukraine to whatever regime is in power in Kiev. Constant military danger: the current Ukie Minister of Defense promised a victory parade for the Ukie forces in Sevastopol, I kid you not. You can imagine what folks like him will have to say to an independent Novorussia. Key problem: this maximalist position leave no incentive whatsoever for Kiev to negotiate. Advantages: Novorussia already gets much more than what it wanted six months ago (see above). By preserving the fiction of a unitary Ukraine this solution leaves everybody a face saving way out and the major outside actors (Russia, US, EU, UN, OSCE) can all sign the deal and be declared guarantors. Also, if Novorussia is nominally part of the “Ukraine v2” then it gives the people of the eastern Ukraine (who are the richest, best educated majority of the Ukrainian population) a chance to counter-act and challenge the rule of Nazis in Kiev and maybe serve as a basis to bring down the current “Banderastan” and replace it instead with a “Ukraine v2”. Furthermore, a united Ukraine would be in a much better position to receive desperately needed international aid and money to rebuild. Considering that at least initially the Nazi freaks would remain in power in Kiev we can be pretty sure that they will further destroy even the little left of “Banderastan” and that, sooner or later, some regime change will occur. If the new regime in power is more or less sane, the eastern Ukraine could demand that those responsible for the mess be brought to trial and that a “truth and reconciliation” type commission be formed. Disadvantages: There is a real risk that the Poroshenko regime will fall and be replaced by a Iarosh dictatorship. Alternatively, southern Banderastan might break away from Kiev and for a “Kolomoiskistan”. Either way, the collapse of the Poroshenko regime risks sucking in the Donbass into a 2nd phase of the civil war with no option for overt Russian aid (covert aid would, of course, be provided). Even the notion of being represented by Nazi freaks in Kiev or to put up with a Ukie flag would be sickening for all those who died in defense of Novorussia. Furthermore, if the deal does not look solid or stable, far from coming back home from Russia, even more Novorussians would “vote with their feet” and emigrate to Russia. Nowadays, even the people of Crimea are still nervous and Russian politicians, including Putin, have had to constantly tell them “no, this time it’s forever, we will never abandon you, this is not something which will ever be overturned”. If the folks in Crimea are worried about their future even though they are now legally part of Russia, you can imagine how frightened and unsure the people of Novorussia would be in any kind of “association” with Kiev, even a purely formal one. These are only a few examples, there are many more which could be listed as advantages and disadvantages for both the independent Novorussia and the “Ukraine v2” option. I think that Russia would prefer a Ukraine v2 version. From the point of view of Russia, it has a lot of advantages (like forcing the “Ukraine v2” to adopt a completely neutral, non-aligned, status). As I have always said, Russia does not want or need the Ukraine. What it wants is a stable, neutral and prosperous Ukraine, and not because Putin and the rest of the folks in the Kremlin are saints or Ukrainophiles, but because that is for the objective best interest for Russia. The only thing Russia needed it already got: Crimea. To those of you who might be appalled at the notion of a less-than-fully-independent Novorussia or a “Ukraine v2” I will say that I very much doubt that Russia can impose such an outcome on the people of Novorussia. Sure, I am not naive, Zakharchenko and current Novorussian leaders got their power in a Moscow-backed change of leadership, so their ties to Moscow are very close, but the real power of Zakharchenko & Co. is that they have the support and consensus of the vast majority of the people of Novorussia, especially those fighting in the NAF. I never believed in a “sellout” of Novorussia (even though I always feared it), and I am confident that should such a “sellout” occur the only real force in Novorussia – the NAF – will never let it happen. Likewise any such “sellout” would trigger a severe political crisis for Putin. All this is to say that while I do believe that, given the choice and option, Putin and his advisors would prefer a de-facto but not fully de-jure semi-independent Novorussia inside a very loose “Ukraine v2” I do not believe that a “sellout” is either what they want or even something they could do: the ultimate guarantor of the de-facto independence of Novorussia is not Putin or Russia, but the armed men of the NAF. What would the people of Novorussia and, especially, the NAF prefer? I honestly don’t know but I suppose that full independence is their preferred goal. Still, the situation is complex and there are very solid argument speaking against such an option and for a “Ukraine v2” (as there very are solid arguments speaking in favor of a fully independent Novorussia and against a “Ukraine v2”). One could also make a case that right now is not the correct time to make this choice. For one thing, nobody knows who will be in power in Kiev in just a few months. The winter is coming and the gas negotiations are becoming huge. Depending on what NATO does or does not decide, one of the other option might become a clearly better choice (just imagine NATO forces in Kiev!). The examples of Korea, Cyprus, Kosovo, Transnistria and many others show that sometimes the only solution is not solution at all. The examples of Ireland or Chechnia show that some solutions are not at all the ones initially considered. Furthermore, I would want to add here that the real end-goal of Russia in the Ukraine is not getting Crimea or saving the Donbass, but to achieve real regime change in Kiev. Only that option would be an outcome which would really please Moscow and, if we keep that in mind, it is not at all clear to me that full independence for Novorussia is the best way to get there. And let us also ponder this question: what is better for the people of Novorussia, full independence from the Ukraine or real, lasting, regime change in Kiev? Just as in chess, time and timing are crucial pieces on the board. Those who over the past few months were hysterically accusing Putin of being a traitor who will backstab the Novorussians simply failed to appreciate the importance of time and timing in strategy. I am sorry to say that, no offense intended, but many people in the West have been raised, educated and trained in a culture of instant action-reaction, of immediate, almost kneejerk, responses. They are used to consider only short-term rapidly achievable options. Russia, and even more so China, are very different in this prospect. These two nations build their immense countries by slow and steady progress, not by short pushes. And though the Russian in the street might also prefer a fast solution to the Ukrainian problem, the folks in the Kremlin, especially former intelligence officers like Putin, fully realize that the “Ukrainian problem” is 400 to 800 years old, depending on how you define it (please read this and this if you are interested) and that it will not be solved in a few months. This is especially true considering that in the current situation the real cause and force behind the current Ukrainian crisis is the AngloZionist Empire. As I have mentioned it here many, many times, the real “real” end-goal of Russia is not even regime change in Kiev: it is regime change on the planet. There is no doubt in my mind whatsoever that both Russia and China want to create a New World Order, but one very different one from the one envisioned by Bush, Fukushima, Obama and the rest of the AngloZionist 1%ers. Russia and China want a complete deconstruction of the AngloZionist Empire, they want to de-dollarize the world economy, the want an multi-polar international world order in which the rule of law is respected because it is understood that it is the most advantageous way to deal with problems. Russia see its future in her North and in Siberia, China wants its economy to go global, including the Far-East Asia and the Pacific region, Africa and Latin America. Russia also wants to role of Latin America and Central Asia to become more important because without these continents and regions there can be no truly multi-polar world. I would also argue that both Russia and China are rejecting the western civilizational model and it’s key dogmas (I won’t list them here lest I offend or infuriate new readers, but my longtime readers know exactly what I mean) and that they are both seeking to create not only a different world order but a different civilization. All this is much, much bigger than the Donbass or even the entire Ukraine. Yes, at this moment in time, the frontline of the global civilizational war is going straight across the Ukraine, but this is only one battle in a much bigger and wider war. Judging by some very telling statements of Zakharchenko in his recent press conference, I am confident that he understands that very well. I have no doubt whatsoever that Putin does. The main conclusion I hope that you all will draw from the above is that we should not jump to conclusions and avoid making big sweeping judgments. If I have convinced you that this is a very tricky, complex and multi-dimensional issue then I am satisfied. If I get another deluge of one sentence slogans in favor of either option, then I failed. As I said, I am not sure that anybody really knows were this is all taking us. For one thing, the Ukies and their western patrons have reneged on every single agreement they have signed since last Fall and there is really no rational reason to expect them to stick to anything they might sign this time. Or maybe these negotiations will lead nowhere and the chaos and “somalization” of the ex-Ukraine will continue. The other day Putin said this: “no matter where the US gets involved they always achieve the same result: Libya“. That is quite true and maybe a libyalization of Banderastan needs to happen before everybody comes to his/her senses. Or maybe, this is terrible to say, is the situation more similar to the one in Chechnia in 1999 when a lot of people had to be simply physically eliminated, killed, before any solution could be found (sadly, but Nazis and Wahabis have that in common that the only way to deal with most of them is to kill them). I honestly don’t know. So let us keep an eye on this incredibly fluid, complex and dangerous situation and not pretend like it is simple and the solution obvious. Stay tuned, as always, I will do my best to keep you posted. All Vaudois know the doctor César Roux, the American president Woodrow Wilson, the baron Pierre de Coubertin, or even Maurice Béjart. By contrast, Ioannis Capodistrias is completely unknown. Nevertheless, like the others, the one-time Russian envoy in Switzerland is one of the sixteen honorary citizens of the city of Lausanne. In fact he was the first to attain this title, in 1816. From Monday [21 Sept 2009] onwards Ioannis Capodistrias will be stirring the memories of the Vaudois and the Lausannois in the aftermath of the inauguration of a bust at Ouchy (see below). This work will have the advantage of shedding light on the role he played at the highest level during the critical historical turning point at the beginning of the 19th century when the Swiss Federation was breaking away from the French Empire, with all the dislocations that involved. Apart from participating in maintenance of the cohesion of the country, this bridge-builder and pacifier born at Corfu in 1776 was also the guardian angel of the canton of Vaud. He succeeded in defending its independence at the demand of Czar Alexander I, who was himself very attached to the canton since his encounter with his preceptor (from Rolle in the Vaud) Frédéric-César de La Harpe. “You want the Aargau? You’re not going to have it! You want the canton of Vaud? You’re not going to have it! And if it comes to that, we may very well exclude you from the Confederation!” The opposition of Count Ioannis Capodistrias to the Bernese campaign for restoration of the old bailiwick system after the Act of Mediation gained him immense recognition in the canton of Vaud, which offered him naturalization at the same moment as Lausanne was for the first time awarding honorary citizenship. These gestures were immensely moving to their recipient: “The sincere affection and esteem that your nation inspires in me long precede, if I may say so, the formal association that is so agreeable to me to contract today.” he wrote on 9th June in a letter of thanks to the Municipality of Lausanne. Commissioned by the Czar to see to it that Switzerland should be emancipated from French influence, Ioannis Capodistrias was brought face to face with a conglomerate of petty republics, at odds on the future of the Confederation, some of them desiring a return to the 13-canton regime that had preceded the Revolution, others wishing to defend the gains of the 19-canton confederation sought by the Act of Mediation. A subtle mediator, he rapidly succeeded in imposing himself in this difficult context as a personality indispensable to the political world of Switzerland. His influence was such that all the cantonal constitutions then under elaboration were subordinated to it. He also attentively supervised the drawing-up of the first federal Constitution adopted on the 7th August 1815, with the new federal pact guaranteeing the independence of the state of Vaud. Having performed these good offices in Switzerland, Ioannis Capodistrias returned to Russia, where he was head of foreign affairs. At that time he was even the minister most favoured by the Czar, but that did not save him from being put on leave in 1822 when he began to exert himself to obtain independence for Greece. When Greek independence was won he was even made the country’s first president in 1827. He then undertook a reform of education, taking the ideas of Rousseau as his point of departure. It is also due to him that potato cultivation was introduced to Greece. . He repelled the danger from Turkey, investing all his fortune in this even to the precious stones from the decorations he had been awarded. But his actions earned him the hatred of the heads of numerous local factions. The sons of one of them put an end to his reign in the most tragic manner. On 9th October 1831 at 6 a.m., on the threshold of the church of Saint Spyridon in Nafplion, he was brought down by two bullets in the forehead and a dagger in the stomach. One of the murderers managed to take flight but the other was lynched by the mob. “The assassination of Capodistrias is a dark page in our history,” says Dimitris Kiritsis, president of the Estia Hellenic Association of Lausanne. But in Greece he is one of our country’s most celebrated figures. His face is to be seen on 20 cent European coins. The University of Athens, the airport of Corfu, and many other institutions, bear his name. A bust inaugurated at Ouchy Lausanne will finally have its monument paying homage to its first honorary citizen. On Monday, in the evening, a bronze bust with the signature of the Russian sculptor Vladimir Surovtsev will in fact be unveiled between the Quai Pascal Delamuraz and the Allée des Bacounis at Ouchy. The ceremony is sure to attract a sizeable and distinguished audience to the shores of the lake. 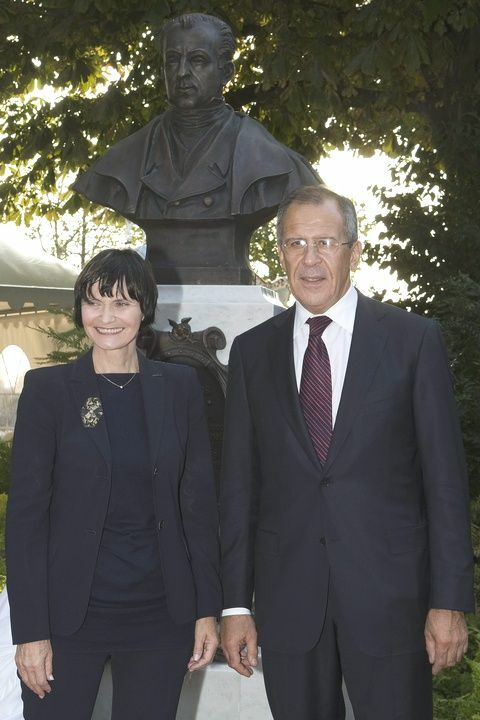 The Swiss Minister of Foreign Affairs Micheline Calmy-Rey and her Russian counterpart Sergey Lavrov will be among the participants, as will the mayor of Lausanne Daniel Brélaz and the President of Vaud’s Council of State Pascal Broulis. For this magistrate of Greek origins, freshly returned from Moscow where he led a delegation from Vaud, the event was of particular significance. “For me Ioannis Capodistrias represents European construction in the positive sense,” he says. Part of a Russian-Greek-Lausannian initiative, the installation of the sculpture was accelerated to make possible its inauguration during the visit to Switzerland of Russian president Dimitri Medvedev, who was nevertheless unable to participate in the ceremony. Greek-Swiss relations are foreign relations between Greece and Switzerland. Both countries established diplomatic relations in 1830. Switzerland opened its consulate in 1865. Greece has an embassy in Bern, a general consulate in Geneva, and two honorary consulates in Zurich and Lugano. Switzerland has an embassy in Athens and four consulates (Thessaloniki, Corfu, Patras, Rhodos). Greece and Switzerland have a long tradition of relations. Before and during the Congress of Vienna in 1815 Ioannis Kapodistrias, a native of Corfu in the service of Tsar Alexander I of Russia, laboured successfully for reorganisation of the Swiss Confederation and for the international recognition of Swiss neutrality. In 1816, he became the first honorary citizen of the city of Lausanne and in 1827 the first Governor of the Hellenic State. Switzerland was one of the nations that supported the creation of the Greek nation in 1830. Two natives of Geneva exercised important functions in the newly constituted Greek monarchy: Jean-Gabriel Eynard as one of the founders of the National Bank of Greece (1842) and Louis-André Gosse was involved in fighting the plague epidemic of 1827 and was a commander in the Greek Navy. During the Second World War, Switzerland represented the interests of numerous countries in occupied Greece and supported the civilian population. During the military dictatorship (1967-1974) in Greece, many opposition figures found refuge in Switzerland. The Swiss Committee for the Restoration of Democracy in Greece was formed in Bern in 1967. Greece and Switzerland have a number of treaties between the two countries, mainly dealing with commerce. Some of the major treaties between the countries deal with Social Security and the avoidance of double taxation in respect of income tax. The balance of trade between Greece and Switzerland is generally toward Switzerland, with Greece having a constant trade deficit. Between 2006 and 2007 Swiss exports to Greece increased 12.9%, while Greek exports to Switzerland increased 26.4%. The main Swiss products imported into Greece are pharmaceuticals and medical supplies, watches, clocks and other luxury goods, machinery and high technology products, electronic equipment, and specific types of food. The main Greek products imported into Switzerland are food and beverages, chemicals, construction materials, and textiles. There are about 48 Swiss companies in Greece which employ about 10’000 people in Greece. Around 300,000 Swiss vacationers visit Greece every year.